Mobile hidden cansafes for valuables take up a proven principle of camouflage and conceal the actual character of the safe by the appearance of a traditional product. The food cansafe fits in a shelf with cans such as those in the garage, in the cellar, in the storage closet safe and is not perceived as a safe for valuables. 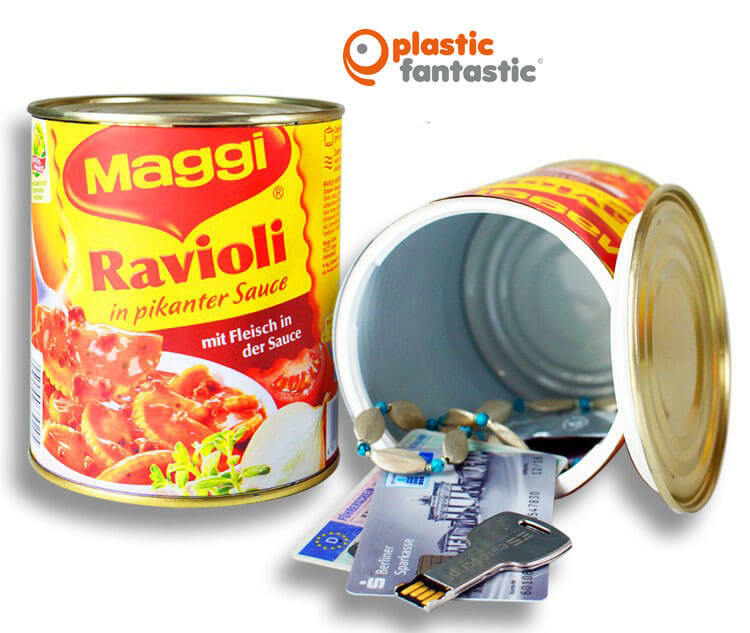 PlasticFantastic hidden safes are unique security products not only for at home. In contrast to conventional safes and containers, they have the advantage of being also used on the road. Whether apartment, garden, office, hotel, workshop, camping, caravan, boat, garage, bathroom, kitchen: this cansafe hides in plain sight and blends into the natural environment. Money, credit cards, jewelry, keys, confidential documents and other valuables or secrets: everything can be discreetly hidden.